I love planning events, everything from weddings, dinners, parties and conferences. I’ve always been a planning person. I remember when I turned 15, I started a notebook with my ideas and plans for my sweet 16. When it was time for my parents to start planning my Sweet 16 I had a notebook full of “grand” plans. Needless to say, not all of my “grand” ideas were taken serious by my parents, but it felt great to see some of my ideas put to life by an Event Planner. Don’t think just because event planning isn’t your thing that you can’t be heavily involved in the event planning process. As a event planner, it is my job to execute every one of my clients ideas and visions for their event within reason. Some clients give me a theme and allow me the control to come up with whatever my creative leads me to, other clients give a detailed vision that I work with them to create for the entire event. Here are 5 event planning tips to help non- event planners plan an event. 1.Organize your thoughts and ideas. Use a notepad or journal to write down all of your ideas, no matter how big or small. List all the detailed that will take place or be needed for your event, set a budget according to the plan. Create a list of things that need to be completed before, during and after the event. Make time to complete your checklist in a timely manner. Build a team of vendors or hire a coordinator to manage all vendors for the event. So, this weekend I had the pleasure of putting together a “Tutus & Pearls” theme baby shower for a client. 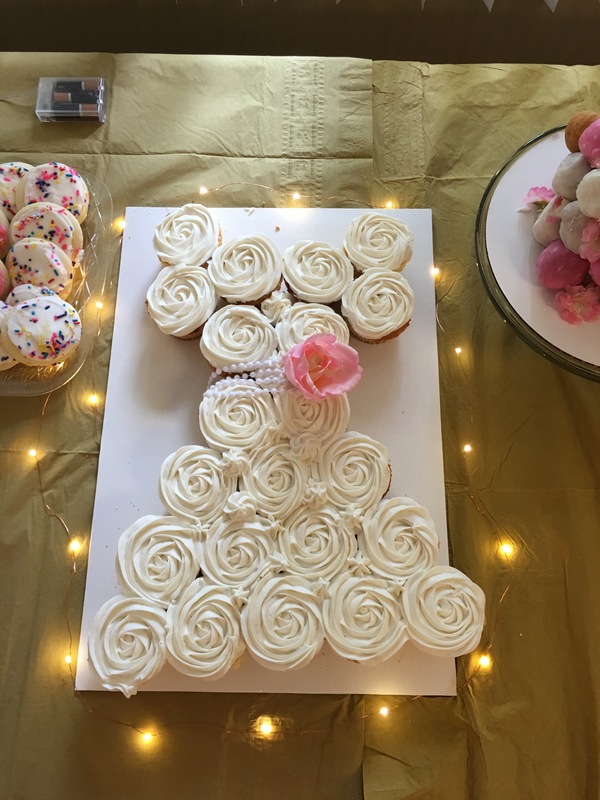 I love doing baby showers because there are so many creative things you can put together to make the most special and memorable occasion no matter how small or large the event. This was my 1st booked event for the year and I’m extremely happy with the end results and so was my client. It was small but filled with so much love. I was able to put together some cool DIY decor for the candle table, gift table and pin for the mommy to be. I was nervous about the final look of the decor being gold and yellow (but my clients get what they want), it turns out better than expected. I’m glad I could make my clients vision come to life. I will share all DIY (How to’s) in Friday’s blog… Stay tuned! For now, here are pictures from the event. 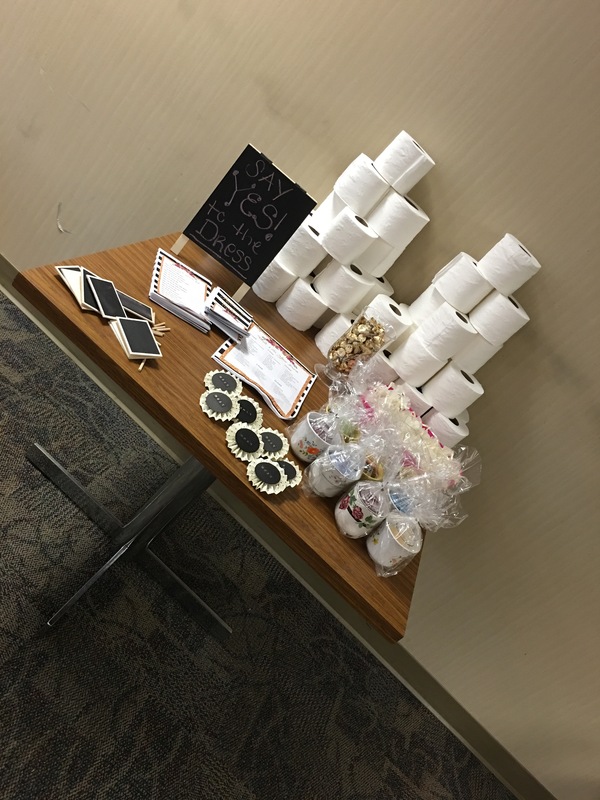 And, just to let you know Dollar Tree, Amazon, and Etsy are my best resources for any event that I put together. I love keepsakes and craft projects, So I put together a scrapbooking station on the entry table. Instead of a guest book, guest were asked to make a scrapbook page for Mommy and Baby. I made the mommy 2 be pin and managed to craft up some cute pillows for the mommy to be chair. This was something she got to keep for the babies room. I’m thinking about putting together an event page on this website to show photos from all my events, what y’all think? Today, I wanted to share with you pictures from my latest Passion Palette Event. I planned, designed and coordinated a Barn Style October Wedding for two special love birds. We finally got the pictures back from the day of the wedding and they look amazing. Bride Bree and Groom Montel reached out to me earlier this year to discuss their vision for a Barn Style wedding. I worked with them to plan their special day, design and decorate the ceremony and the reception hall, as well as coordinate the day of the event. This was the first wedding I have planned, designed and coordinated. I must say it was a night to remember. Special thanks to the all the Vendors. They were all amazing and easy to work with. Each vendor played a huge role in making sure our Bride, Groom and Family were pleased with their wedding day and service for the event. 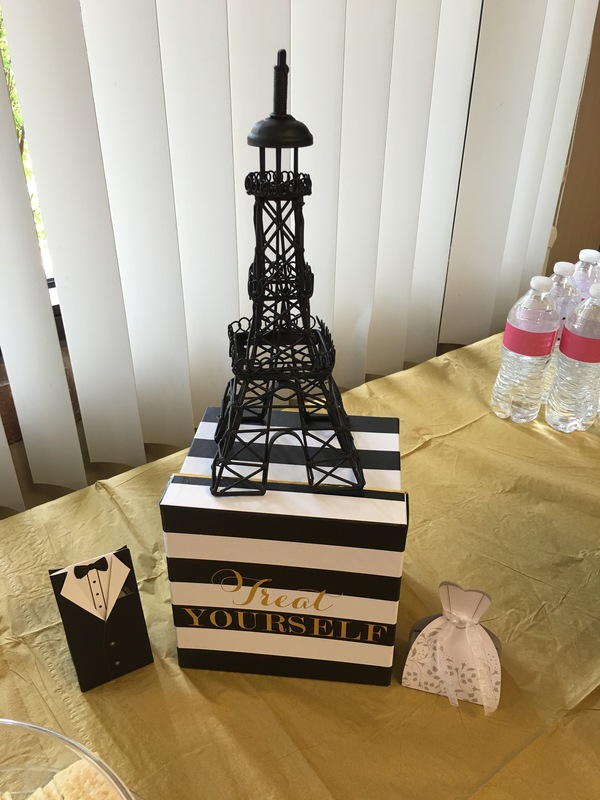 For more information about Passion Palette Event services, click here. I’m so in love with planning events. It’s like therapy for me. And I enjoy making others happy. All year I have been planning and plotting for my friends bridal shower. We did a French Tea Party and it turnt out great. For starters, I wanted to give the room a welcoming layout. I knew that everyone at the shower won’t know one another but I wanted everyone to mingle. 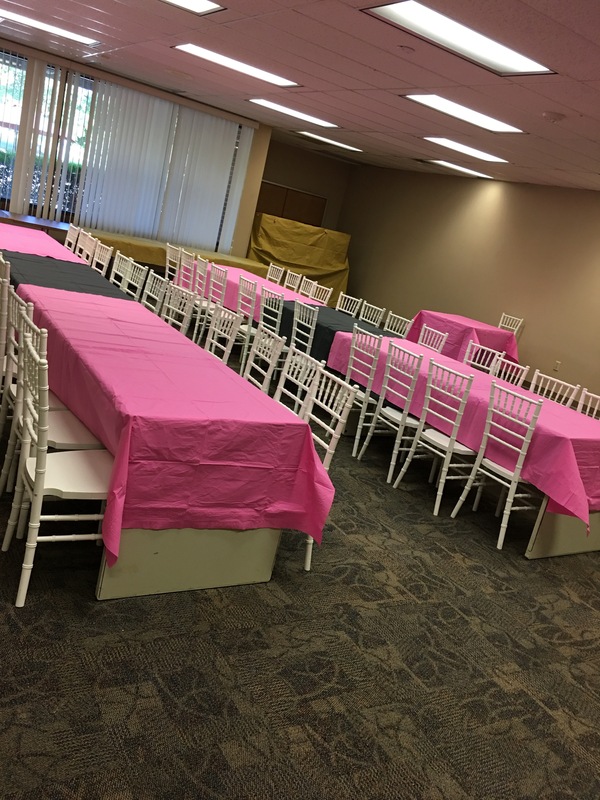 So instead of doing single tables, I lined the tables up to make two long tables. As a cost saver, I used paper table clothes from party city for $3.99 each. Much cheaper than renting cloth linens and better than plastic. The tables were dressed with assorted tea sets that I’ve been collecting all year. 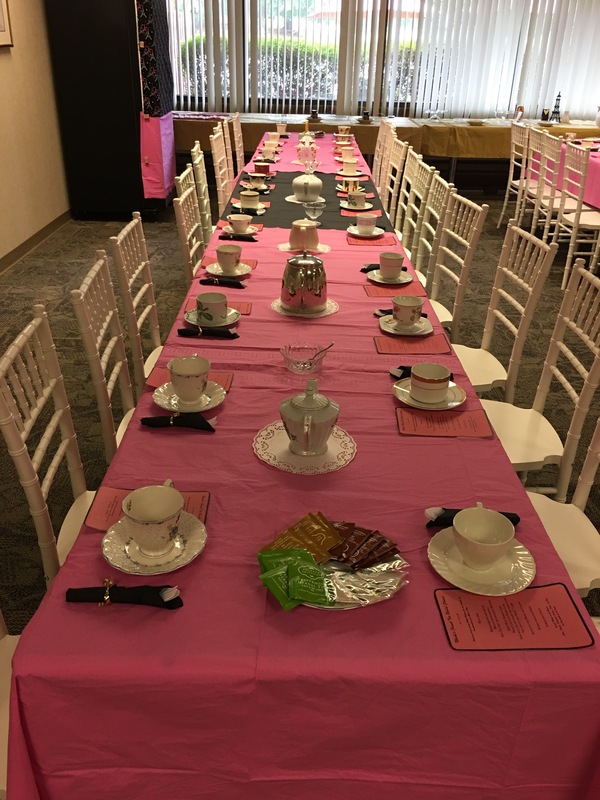 Each place setting had a different style tea cup and saucer to add color to the room. Tea pots were aligned down the centers of each table, no two alike. I started collecting these at the top of the year from different thrift stores in my area. Altogether I purchased about 50 tea cups and saucers and 10 tea pots. I didn’t really keep track of how much I spent on these all together but everything was cheap. In between each teapot I set up clear sugar bowls, an each end of the tables stored a small platter of assorted tea bags. To complete each table setting, there was an event program on the left and rolled utensils on the right. As guest started to arrive, the host use Kettles to put water warm and the tea pots filled. 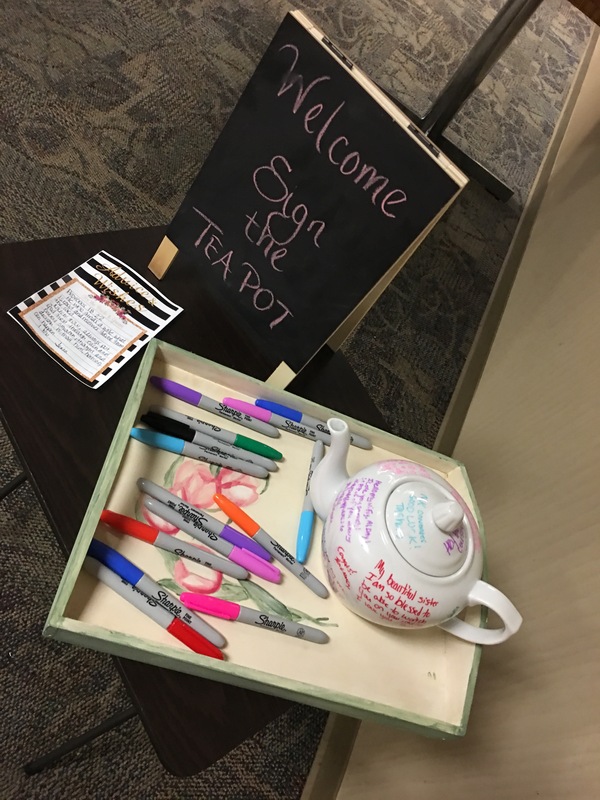 Guest were asked to sign the brides personal tea pot at the entrance. I saw this idea on Pinterest and thought it would be a great replacement of a traditional guest book. It also helps the bride preserve her memories of this joyous occasion. The food table was just a quick creation of mine the day of the event. The table lead off with a fruit and vegetable platter. I found that it was cheaper to make the platters myself instead of buying several $20 platters to feed 50 people. 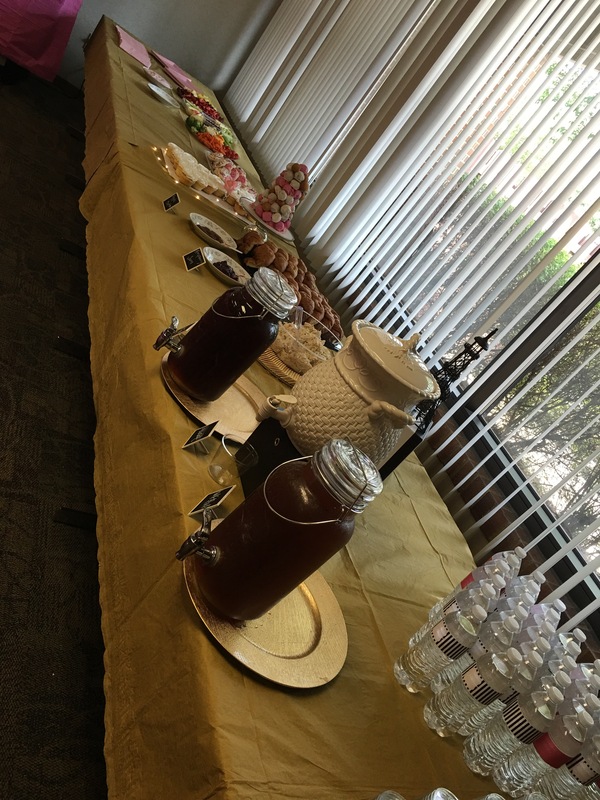 There was also croissants and jams, cookies, brownies, and chicken salad with cracker. And cake of course. Most importantly the iced tea selections. I was lucky enough to find three serving pitchers during my thrifting, each were less than $10. Sweet Tea, Iced Tea with lemon, and Unsweet tea was served cold. I even found a template for water bottle labels. The cake was designed and made by a every creative friend of mine. I sent her a photo of a pull a part dress cake and she went from there. She always delivers delightful treats whenever I plan events. This little number here, was just something last minute that made a lasting impression. 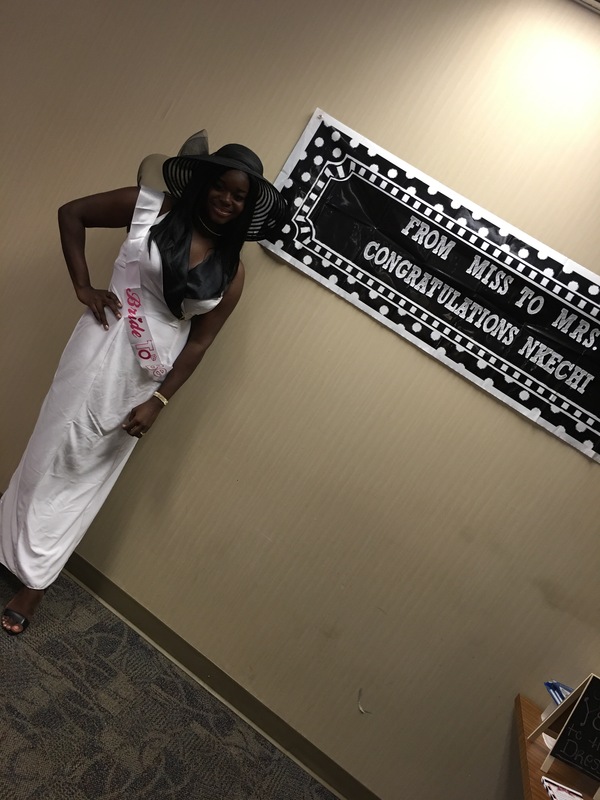 And what is a bridal shower without games! We played a fierce games of say yes to the dress, what’s in your purse, and how well do you know the bride. I’m so happy this event turnt out the way it did. And the bride loved every minute of it. It brought joy to my heart to know that I made her smile. I already have another project I’m working on and cannot wait to share it with you. But until that time be sure to like, comment and share this post! And thanks for stopping by PassionLocked, ttyl!! I love birthdays and planning events. It is truly one of my passions. This year me and my friends all turn 25. Many don’t consider this a milestone birthday, but I do. I mean I thought my teenage years were strange. Well being in your 20’s is an emotionally roller coaster. And you need a support system and strong well to keep you pushing through. My friends and I have been through a lot and have accomplished so much together and individually. So I came up with the great idea for us to plan each other’s 25th birthday celebration. I’m creative one in the group so I’ve been leading this mission (plus it was my idea). 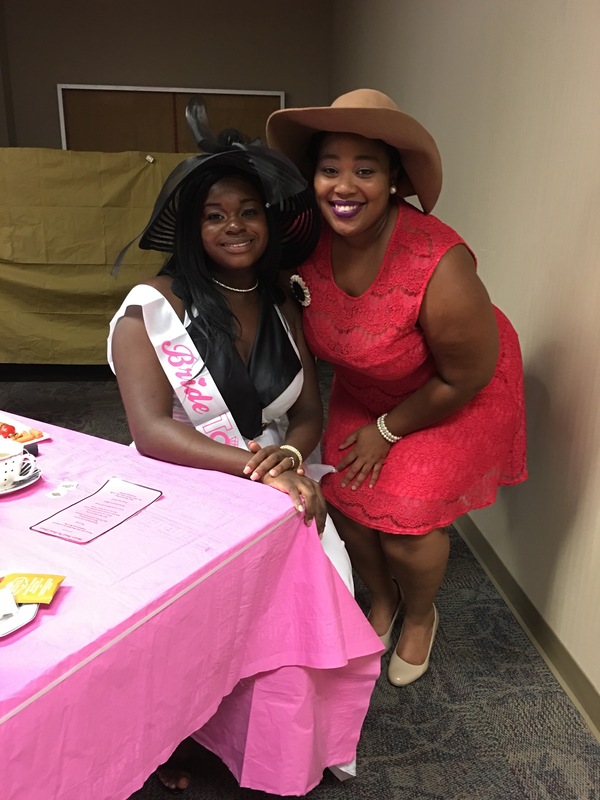 Last month I planned a birthday event for one of my girls. We all got together for brunch and wine tasting. It was really nice! The day was filled with good conversations, laughs and cries, great wine and most importantly friendship. To end the day, I wanted to leave the girls with something special to “Remember the Time”. So I came up with this idea to make picture frames, as party favors. I took a visit to Michael’s craft store to pick up some acrylic paint, glitter, modge podge, and wooden picture frames (one larger than the other). I used the color blue because that’s the birthday girl’s favorite color. First, I took the larger frame and painted it completely blue. Next, I coated the smaller frame with modge podge and sprinkled silver glitter all over it. Then, I let both frames lay flat on a sheet of newspaper to dry over night. The next day, I used a hot glue gun (and glue gun sticks) to glue the smaller frame on top of the larger frame to make this masterpiece (pictured on left). This made the day even more special. 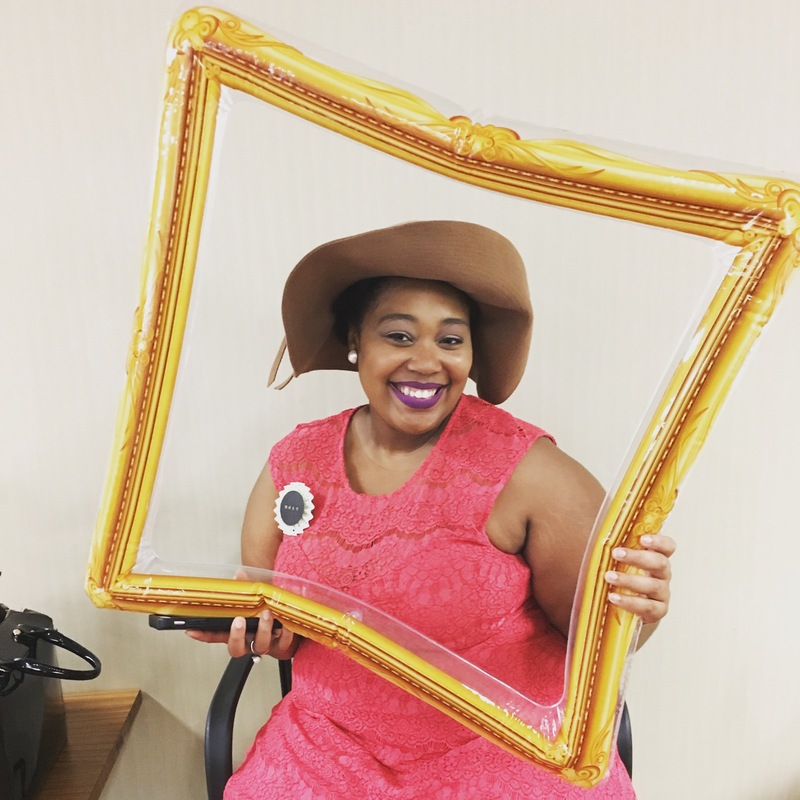 We all took pictures with the birthday girl and everyone got a Frame Party Favor to “Remember the Time”. Try it for your next event and let me know how it turns out, See you Friday!